I’ve been to Antarctica four times, and seen a lot of penguins. I’ve also worked in various places for more than a couple of decades now, and seen a lot of penguins. I am also trained in behavioural psychology – so I observe things about behaviour and see patterns. I can’t not! One of the most amusing types of Antarctic penguins is the Adélie. It has some really interesting characteristics. They travel in packs. When they pop out on the sea ice they are the boss of everything. Roaming around in packs like they own the place; all dressed up and no place to go. This struck me as exactly parallel to, say, walking around the centre of Sydney (or Melbourne) on a Friday night just after 5; or cruising an airport business lounge. That isn’t the whole story either. As well as their besuited swagger, Adélie penguins have another really interesting characteristic. In 2008 and 2009 I went to Davis Station, and assisted with station resupply along with a bunch of other stuff. I got to watch a lot of penguins coming in from the ocean to breed. On the undisturbed fast ice, the penguins rule the place. However, when the mobs of Adélies got to a new feature – for example a line of snow piled up along the sea ice, after a snowplow had cleared a path – they all stopped. Even though the penguins could easily have jumped or slid across over this new barrier and carried on, they stopped. They walked up and down along the line. They discussed the matter internally. Eventually, after many meetings, one penguin would dramatically cross the barrier. This led to a most fantastic observation. 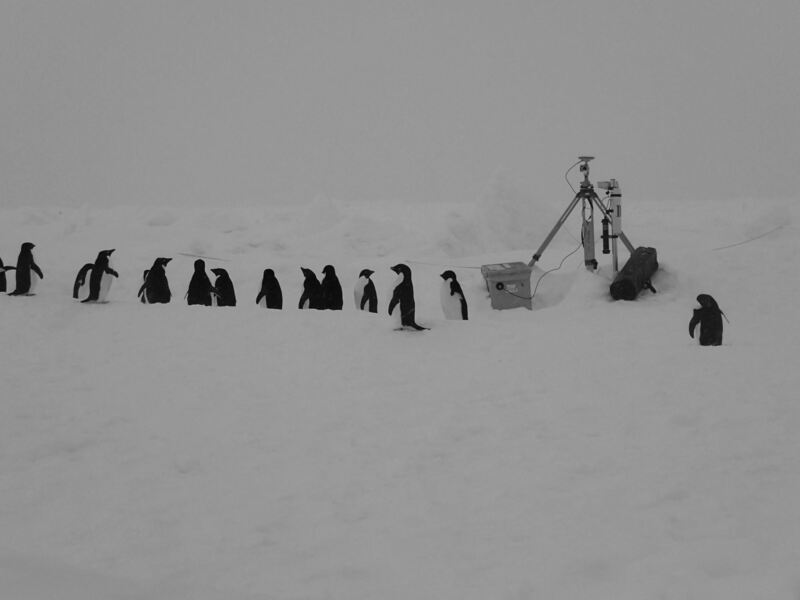 Every other penguin would take the cue and cross the barrier – but not where they stood. They would all go as close as possible to where the innovative penguin crossed, and cross the barrier there. Even if it’s much farther to walk, or ends up going someplace less than ideal for the penguin mob. Every penguin sticks to the program. Having observed behaviour of people in work environments for a long time, it completely struck me that this same pattern is played out across the business world. We faff around and try as hard as we can to do anything but cross some menial but unusual barrier; then when one innovator makes the leap, we all follow! Penguins, trying to work out what on earth this strange three legged creature is.. I want to draw a parallel here to the work of foundational cognitive researchers who proposed that our cognitive world is constrained by the language we use about our world. In other words, if we limit the number of ways we can express an idea as language, we limit the possible number of ideas we can have. I first came across this concept (neurolinguistic relativity) studying linguistics a long time ago. This review seems like a good way to learn about the idea. It specifically also calls out perception – as if the way we frame language also interacts with the way we are able to perceive things. Without any reference to actual research, I want to extend this to visual language. In business, we still hear about ways to dress; ways to express a visual lexicon of what is a ‘business like’ appearance in dress, styling of offices, everything. Countless business articles talk about what to wear, all ending with more or less the same pattern (here, here ). We also make up science about it without considering the fact that, well, all our cultural messaging says that we should be penguins. Even if we don’t impose ’suits’, we make recommendations to homogenise our visual language around roles. I’m proposing here that we limit how we can do business by restricting our visual language around what we think appears business-like. In particular the uniformity of business ‘dress’. In effect, we design a limit around how we can think about problems. So we end up solving our own issues in the same way that Adélie penguins do. In the familiar, we strut around like the boss of everything. Faced with a new obstacle, even though seemingly simple, we look it up and down, have endless meetings, and create a lot of extra work for ourselves. When someone finally makes the leap, we all go to the same point and follow. …which once more ties the analogy neatly to penguins! Even movie studios agree – if you’ve ever seen Happy Feet, it’s an entire film about this premise. By designing a restrictive visual language; and a restrictive set of social mores around how to dress for business, we limit our ability to do business well. So we should do something different! Sure, the usual roles of social engagement apply – as in ‘turn up to a workplace in clothes that are clean and relatively fresh’ – but really, we’re all grown ups. We can work out what works for us and what doesn’t. I turn up usually in a t-shirt and my faithful cactus pants. Because my identity is strongly tied to outdoor activities, I generally work and feel best in stuff which works for me. I’m ready to work, I’m comfortable, confident and don’t feel like I need to get home to get this goddamn tie off! …and then I have a supply of outdoor gear when my kit gets one too many coffee spills for work (which also has sustainability implications – I buy vastly fewer things and use them more). But there’s more. Before this is dismissed as a smackdown on suits (which it is… c’mon) – it applies equally to anyplace where visual and cultural homogeneity in an organisation is dominant. It might not be suits, it might be ‘oh you need to only drink red organic IPA made from hops fertilized specifically with cowshit which magic mushrooms grow on’. Or ‘you can wear what you like but we’re gonna judge your selection if it’s not brand Y’ – Which brings up the next section. In the ten years I’ve been meaning to write out this janky anecdote, I’ve realised that a fun little dump on the concept of ‘dressing for business’ (I mean sheesh, who puts a noose around themselves then heads off to work. Symbolism much?) is just a side note to the main story. Penguins are programmed by millennia of evolution to operate the way they do in order to survive. Their actions at a pile of snow reflect their actions at an ice floe edge – a test subject is sent into the water, if they’re not eaten by a leopard seal then everyone else goes in near the same (presumably still safe) spot. Humans don’t need to act that way – but we have designed our society to do so. It seems completely crazy that we design a visual language which limits our ability to create; to innovate; and to feel comfortable and confident – in the name of a really limited view of appearance. Sure, you don’t want people turning up to meetings in their underpants; but it’s not a black and white scenario. Even as an extremely privileged as a white man I’ve been judged on appearance for work over my lifetime. Now, as an extremely privileged white man with 20 years experience and a PhD, I don’t want to or need to work for you if you think my apparel is what makes me employable. Women, people-of-colour, non-binary-gender folk all have a much harder time. And often don’t get to have that choice – so spend entire lives trying to squish themselves into some boxed up ideal of appearance. I can’t speak to how that affects people, since I don’t have that lived experience. It’s not something I would ever willingly submit to given a choice. I can, however, fall back to science and say ‘hey, letting people express themselves by way of how they turn up to work will make your business buzz!’. And also ‘it’s totally nuts to correlate performance with a particular way of dressing. It’s time, as a society to drop the pretence of ‘business dress’. I mean it’s just stuff you put on your body – not a metric for judgement. Or a magic performance enhancer. We don’t need to be penguins, we have an alternative. Sugata Mitra expresses the idea well in this TED talk. To paraphrase – our entire system of education and business has not been updated since the Victorian era. This is a problem – it leads down all kinds of roads. And as Sugata Mitra points out – what’s next? Why are we sticking with this model, now that it no longer applies? There is always a case for meaningful dress in meaningful circumstances. For example, a paramedic absolutely needs to be identifiable instantly as a paramedic from far away in a messy post crash scene. A tree feller needs protective equipment, which comes only in certain styles and therefore restricts how they can look on the job. Hell, when I was observing penguins I was wearing standard issue Antarctic field equipment – not my personal choice of awesome outdoor gear. …but an office worker, a secretary, a brand manager, even a CEO – has no such practical need. We make a lot of excuses up around why we should all look the same in a business context – ‘perceived risk’; ‘impression counts’; yadda yadda. This actually reinforces the point of this little tale – if we increasingly narrow the scope of how we can express ourselves visually and cognitively in a business context, we narrow the scope of how we are able to solve problems. In reality, we all work better when we feel comfortable about how we appear, and we all work better when we have some agency about how we go about our work. For most occupations, we can diversify our visual language around how we look. In this scenario we move from something as simple as clothing from being a rigid bond to a particular way of looking and thinking. Instead, we can alter our visual language and open up new, unforeseen avenues to a diverse, fulfilling, relaxed and creative working life; where innovation happens freely because people feel valued and have agency over even one small thing – their favoured appearance. We organise our labour along lines which benefit the organisation most. In the technical industry, we use prescribed processes and methods and ways of interaction. In customer service, we need predictable hours and have prescribed ways of going about our job. In science? the same. In a place where required processes dominate, using how we dress as a tool for diversifying our visual language is a small but vital freedom of expression. Let me segue to another story here. Some time ago a senior scientist confided that they were not looking forward to visiting Canberra and having to talk to a roomful of people in suits. I said ‘visualise them all as penguins’ – which immediately turned a frown upside down. And offered a glimmer of validation for the wild idea being discussed here. I hope that next time you walk into your boardroom, or staff meeting, or office cafeteria, you see something that breaks that analogy. If not, I hope you have to catch a sly giggle as you take your seat.